Written by Anne M. Slanina, Ph.D.
Price: 9.99 FREE SHIPPING IN US! AUTOGRAPHED! 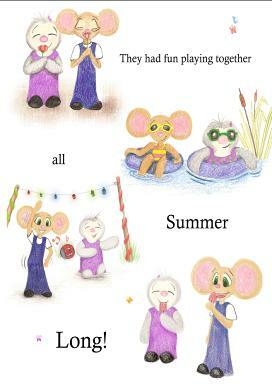 Annie Mouse Meets a New Friend is the third book in a series designed to help adults guide young children through difficult situations. In this episode, Annie befriends someone who is different and in the process is subject to ridicule and risks losing her old friends. After being torn between her loyalty to her old friends and her new, genuine friend, she learns what it means to be a true friend. Ideal for discussions about peer pressure, bullying, befriending a special needs peer and friendship and loyalty. Good for ages 3-12. Available in soft cover only.